Once feared as making the role of the recruiter impersonal and robotic, Artificial Intelligence (AI) today gives recruiters the information they need to source and hire higher-quality professionals. Those are the findings of a global Korn Ferry (NYSE:KFY) survey of nearly 800 talent acquisition professionals. Nearly two-thirds (63 percent) of respondents say AI has changed the way recruiting is done in their organization, with 69 percent saying using AI as a sourcing tool garners higher-quality candidates. When asked to compare the quality of candidates today to 5 years ago, when AI was still in its infancy, 59 percent said candidates are more qualified today, and 51 percent said roles are filled in a more timely manner. According to the survey, talent acquisition professionals are welcoming AI as a tool. Nearly half (48 percent) say big data and AI are making their roles easier, with 40 percent saying the top way it helps is providing valuable insights, and 27 percent saying it has freed up their time. Of the 14 percent of respondents who say AI has made their jobs more difficult, the majority say they have too much data and they don’t know what to do with it. To further solidify AI’s role in recruiting, the vast majority (83 percent) of respondents say they have at least some understanding of how AI can impact the recruiting process, and 87 percent say they are excited about working with AI even more in the future. 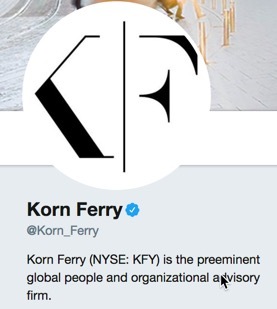 Korn Ferry is a global organizational consulting firm. We help companies design their organization – the structure, the roles and responsibilities, as well as how they compensate, develop and motivate their people. As importantly, we help organizations select and hire the talent they need to execute their strategy. Our approximately 7,000 colleagues serve clients in more than 50 countries.